Tesla 2018 annual meeting is June 5, 2018. Tesla, Inc. (TSLA) designs, develops, manufactures, and sells electric vehicles, and energy generation and storage systems in the United States and internationally. If Tesla is to survive and thrive, it needs a more independent board. The vote of shareholders will be crucial in deciding Tesla’s future. Most shareholders do not vote because reading through 50+ pages of the proxy is not worth the time for the small difference their vote will make. I have done the work for you. Below, I tell you how I am voting and why. If you have read these posts related to my portfolio for the last 22 years, have values aligned with mine, and trust my judgment (or you don’t want to take the time to read most of the post), go immediately to see how I voted my ballot. Voting will take you only a minute or two. Every vote does count. I voted against the Board’s recommendations 100% of the time on the Tesla 2018 proxy. View Proxy Statement via SEC’s EDGAR system (look for DEF 14A). Read Warnings below. What follows are my recommendations on how to vote the proxy in order to enhance corporate governance and long-term value. 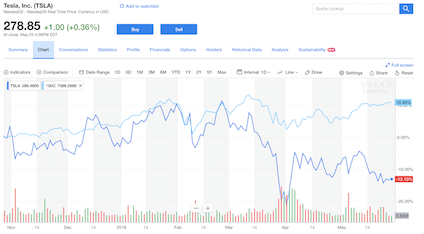 From the Yahoo Finance profile: Tesla, Inc.’s ISS Governance QualityScore as of May 1, 2018 is 6. The pillar scores are Audit: 2; Board: 7; Shareholder Rights: 6; Compensation: 6. Corporate governance scores courtesy of Institutional Shareholder Services (ISS). Scores indicate decile rank relative to index or region. A decile score of 1 indicates lower governance risk, while a 10 indicates higher governance risk. Therefore, we need to pay closer attention to Board, Shareholder Rights and Compensation. Egan-Jones Proxy Services recommends “For,” all three board nominees. However, E-J noted this is a classified board with directors considered affiliated who E-J would recommend against if up for reelection, including Elon Musk. Why wait? There are enough problems at Tesla to warrant voting against all directors up for reelection now. The CtW Investment Group criticized the three Tesla directors up for election as being too close to Elon Musk or unqualified. ISS wrote that Gracias, CEO of Valor Management Corp, is not sufficiently independent for key board committees. It also cited concerns regarding the lack of performance-based elements in Tesla’s pay plan in recommending the vote against Gracias, a compensation committee member. ISS wrote that Murdoch is “overboarded” since he serves as the CEO of Twenty-First Century Fox Inc (FOXA.O) and on other boards. (ISS sides against two Tesla directors, backs split of Musk’s roles) Glass Lewis recommends against all three directors up for election. Vote Against all director nominees. I have no reason to believe the auditor has rendered an inaccurate opinion, is engaged in poor accounting practices, or has a conflict of interest. However, Egan-Jones notes that PricewaterhouseCoopers, LLP has been serving as the Company’s auditor for over seven years and their independence is compromised. They also have several other issues and recommend voting Against. I also believe that the companies should consider the rotation of their audit firm to ensure auditor objectivity, professionalism and independence. I have not set a specific number of years. In this case I voted Against. This proposal was submitted by Jing Zhao, another frequent voice in shareholder advocacy. The proposal is straight forward: “shareholders recommend that Tesla adopt a policy that the chairman of our board of directors be an independent director.” He goes on to remark on several potential conflicts of interest. We believe that there is an inherent potential conflict, in having an Inside director serve as the Chairman of the board. Consequently, we prefer that companies separate the roles of the Chairman and CEO and that the Chairman be independent to further ensure board independence and accountability. After evaluating the details pursuant to the shareholder proposal and in accordance with the Egan-Jones’ Proxy Guidelines, we recommend a vote FOR this Proposal. I understand ISS is also recommending a vote For. Last year’s vote on a shareholder proposal to declassify the board should give us a good gauge on how this proposal is likely to go. That proposal won a little over 30% of the vote, which was good, considering that Musk and other insiders hold about 26% of the vote. All those shares were voted against, leaving 74% to fight over. Key will be the votes of Fidelity and Baillie Gifford, which together own about 16%. I fully expect the support of T. Rowe Price and Vanguard. Baillie Gifford is supportive of proxy access in principle, believing that long-term shareholders should have the ability to place director nominees on the proxy ballot. Fidelity generally will vote in favor of proposals that include ownership thresholds of at least 3% (5% in the case of Small-Capitalization Companies); holding periods of at least three years; establish the number of directors that eligible shareholders may nominate as 20% of the board; and limit to 20 the number of shareholders that may form a nominating group. Although my proposal does not completely conform to that policy, it is close, and the Board can modify my recommendations at their discretion. I understand ISS recommends a vote For. As to the substance of the proposal, it closely mirrors the SEC’s universal proxy access Rule 14a-11, vacated after what many believe to be a biased court decision regarding the SEC’s cost-benefit analysis. Proxy Access in the United States: Revisiting the Proposed SEC Rule, a cost-benefit analysis by CFA Institute, found proxy access would “benefit both the markets and corporate boardrooms, with little cost or disruption,” raising US market capitalization by up to $140.3 billion. Public Versus Private Provision of Governance: The Case of Proxy Access found a 0.5 percent average increase in shareholder value for proxy access targeted firms. A note of thanks to Proxy Insight. I have a growing appreciation for their voting history database as well as their new policy checker tool, allowing users to review the proxy voting policies of most large institutional investors by topic. I hope to make better use of this resource going forward. Proxy Democracy is still down. I am starting to look for contributions to bring it back to life. Proxy Democracy provided information on votes cast in advance of annual meetings by institutional investors at thousands of companies. If you think that is worthy of financial support, please contact me. As I write this, Proxy Insight had reported on Teacher Retirement System of Texas, which voted Against Gracias and Murdoch. They voted in favor of all other items, including the shareholder proposals. I see Trillium voted the same as I recommend below. Classified board with staggered terms. Shareholders cannot call special meetings. Supermajority vote requirement (66.67%) to amend certain charter and certain bylaw provisions. No proxy access to allow shareholders to place nominees on the proxy. Stockholders may present proper proposals for inclusion in Tesla’s proxy statement and for consideration at the next annual meeting of stockholders by submitting their proposals in writing to Tesla’s Corporate Secretary in a timely manner. In order to be included in the proxy statement for the 2019 annual meeting of stockholders, stockholder proposals must be received by Tesla’s Corporate Secretary no later than December 27, 2018, and must otherwise comply with the requirements of Rule 14a-8 of the Securities Exchange Act of 1934, as amended (the “Exchange Act”). Few firms admit to having average executives. They generally set compensation at above average for their “peer group,” which is often chosen aspirationally. While the “Lake Woebegone effect” may be nice in fictional towns, “where all the children are above average,” it doesn’t work well for society to have all CEOs considered above average, with their collective pay spiraling out of control. We need to slow the pace of money going to the 1% if our economy is not to become third world. The rationale for peer group benchmarking is a mythological market for CEOs. For more on the subject, see CEO Pay Machine Destroying America. Genomic Health 2018: Will Baker Bros Vote Proxy Access?